In 2006 planning consent was granted to Charles Church homes to construct a new school playing field on a parcel of grazing land to the east of St Ann's Heath School, Virginia Water, as well as a new housing development on part of the original playing field to the west. As part of the planning consent, an archaeological investigation of the site was requested, prior to any redevelopment taking place. The need to maintain a green space for the use of the school, meant that no groundworks could take place on the site of the new residential area until the construction of the new playing field was complete. The site was therefore investigated in two separate phases, and this report provides an overview of the fieldwork carried out in phase 1, ahead of the construction of the new playing field. 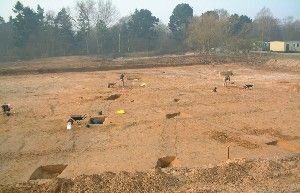 In August 2006 an archaeological evaluation was undertaken by Surrey County Archaeological Unit staff, who supervised the machine excavation of ten trenches across the proposed development area. The site was located on the Bagshot Beds sand, but gravel deposits forming part of the Taplow Terrace, River Terrace Gravel were also noted during the fieldwork. The site had a variable topography, with fairly level ground at the northern end of the site, but with sloping ground to the south, that continued to slope beyond the site boundary and down to the River Bourne. This north/south slope was not as steep, however, on its east/west axis, creating the impression of a shallow dell across the southern part of the site. Very little archaeological material had been found previously in the general area, but the location of the site close to the River Bourne gave it additional potential, particularly with regard to the prehistoric periods. The evaluation trenches revealed a variety of features, primarily ditches, crossing the site, some of which appeared to be prehistoric, potentially dating to the Bronze and Iron Ages. The Bronze Age features in the southern half of the site also appeared to be buried beneath several layers of silty sand, suggesting they had been covered either by hillwash (colluvium), or river flooding deposits (alluvium). In order to create the level surface required for the playing field, the contractors were to truncate the northern part of the site, and use this material to infill the slope to the south. It was therefore decided that full excavation should proceed across the northern part of the site, whereas the archaeology to the south could be preserved in-situ under the re-deposited soil. It was agreed however, that a program of geoarchaeological trenching and environmental work would take place in the southern area, in order to understand the nature of the silty sand deposits, and their relationship to the archaeological features. The geoarchaeological investigations took place in March 2007, with the excavation following close behind during March and April 2007. Stripping of the site revealed a variety of features dating to the Bronze Age, Iron Age, medieval and Post-medieval periods, but flintwork dating to the Mesolithic and Neolithic periods was also collected. The oldest feature discovered during the fieldwork, was a shallow pit in the north-east quadrant of the site, that contained burnt flint, pebbles and sherds of a Middle Bronze Age pottery vessel. The feature may have been a cremation deposit, but no bone survived due to the acidic conditions of the soil. The most substantial feature identified on the site was a large enclosure or boundary ditch that contained pottery of Late Bronze Age/Early Iron Age date. It became clear during excavation of the ditch that it was not a single phase feature, but had been subject to several episodes of re-cutting, suggesting maintenance and re-use of the boundary over a sustained period of time. The enclosure had also been extended during the Mid-Late Iron Age, creating either a trackway, or perhaps ditches either side of a hedgerow. A small pit and gully dating to the Late Iron Age were also identified during the evaluation stage of the project. Significant evidence of Early-Middle Iron Age occupation was also found during the phase 2 excavation of the residential area site. Features included a north-west facing roundhouse ring gully, four and six post structures, and many pits containing pottery, loomweights and iron smelting slag residue, all indicative of intensive occupation during the earlier part of the Iron Age. The Iron Age features found on the playing field site therefore seem to be peripheral to a larger area of settlement to the west. Geoarchaeological investigation of the layers in the southern part of the playing field site revealed a buried soil horizon (palaeosol), and showed that the series of layers identified during the evaluation, were waterlain deposits that had formed during the Late Bronze Age/Early Iron Age within a shallow dell. The deposits were colluvial, and had been created by soil from a destabilised landscape upslope of the dell, being washed downhill and then settling at the base of the slope. The presence of the large Late Bronze Age/Early Iron Age boundary ditch at the north end of the site, shows considerable anthropogenic activity in the area during this period, and prehistoric farming or clearance activities probably caused the destabilisation of the landscape. The discovery of these layers is therefore of some importance, as they suggest land clearance and, by implication, farming activities, first occurring in the later prehistoric period. Two stretches of ditch were identified as belonging to the late medieval period, and they may have originally formed a single field boundary running roughly north-south across the centre of the site. A series of ditches dating to the 17th or 18th century were also discovered, cutting through all the earlier features, and lying on a different alignment to both the medieval and prehistoric boundaries. The ditches were spaced roughly 20m apart and seem to form a field system, but as they were not shown on the 1840 Tithe, or later Ordinance Survey maps, it is assumed they became obsolete by the mid 19th century. Residual Roman pottery was also recovered from one of the post medieval ditches, suggesting a presence during this period even though no Roman features were identified. The location of the excavation in the grounds of St Ann's Heath School, gave a superb opportunity to incorporate an outreach project for the school, and SCAU education officer Abby Guinness arranged an assembly and a series of site visits for 240 children over the course of 2 days in March 2007. The children had the chance to handle artefacts from the site and SCAU's education handling collection, and learn about the work of archaeologists. Many aspects of what the children saw during the site visits were incorporated into their academic project work for the rest of the term. Parents from the local community were also invited to an evening tour of the site, and learnt much about the archaeology and local history of their area. The archaeological discoveries made at St Ann's Heath School are of great importance on both a local and regional level, and the information gathered gains increased significance when put into context with the discoveries made at the adjacent residential area site. The excavation also provided an excellent opportunity for community involvement and education, often seen as being difficult to incorporate into commercial projects, and it is envisaged that further outreach work will take place in the form of formal evening lectures for interested groups. An assessment report for the excavation has been completed and it is hoped that the site will be brought to full publication later in 2009. Further excavation work was carried out on the site in 2008. 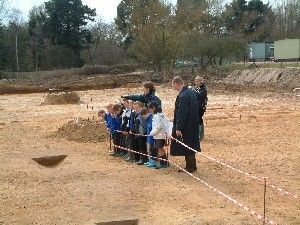 Find out more here: Further excavations at St. Ann's Heath Primary School, Virginia Water (2008).